If there is one thing you can usually bank on at Wrestlemania it is that the Undertaker will emerge victorious from whatever match he is in. His record going into the 30th iteration of the WWE's showcase event was 21 wins and 0 defeats from a glittering career spanning 3 decades. Imagine then, the absolute shock that swept through the Superdome in New Orleans when Brock Lesnar delivered three F5's to Undertaker over the course of their 25 minute match. These eventually took their toll and Lesnar completed the 3 count to take away Undertaker's cherished winning streak. 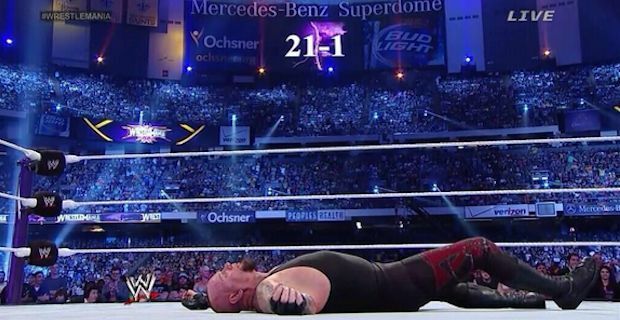 Once the ref shouted 3 and Lesnar began to celebrate, the Superdome descended into a deathly silence. People wondered if the ref had made a mistake with the count but then, after a confusing number of seconds for fans, Lesnar's theme music blared out to end all the doubts. Many fans were in total despair once the gravity of what just happened had sunk in. Boos rang out in the Superdome and many fans burst into tears. Meanwhile, the WWE is laughing all the way to the bank as the event became the largest grossing event to ever be held at the Superdome. The WWE is known for it's controversial storylines but this one may just have topped them all although Mr. Kennedy calling out Barack Obama also has to be up there in terms of shock value.